The business aircraft market has never been hotter, but that doesn't mean everything is perfect. As the National Business Aviation Convention rolls into the Georgia World Congress Center in Atlanta on Tuesday, NBAA and its allies in general aviation remain embroiled in a political battle in Washington that could fundamentally change the way general aviation operates in the U.S. While there have been some encouraging signs about the future funding of the FAA, the battle over user fees is far from over, judging by the banners outside the convention center. Organizers expect about 30,000 attendees and more than 1,000 exhibitors to talk business about aircraft in the coming few days, many opening their wallets to sign on the dotted line for a growing number of exciting turbine jet and turboprop flying machines. Everything from the PJ and VLJ makers will be on sale, with light jets, mid-size jets and mega-million-dollar global flyers soaring out the doors of the virtual showrooms, so to speak. And as commercial air travel continues its downward spiral into the pits of hellish-level service, expect the lines to be long at the booths of fractional operators such as NetJets and Planesense where smart buyers will be buying just the piece of jet or turboprop that they really need. Add to that a serious boom in the glass avionics world, and you have an NBAA show that is sure to please both buyers and sellers. ...And a pending takeover in the piston single sector could overshadow the turbine-oriented NBAA show, with Cessna rumored to be buying Columbia. The GA industry has been agog, the last few days, at the news that Cessna's parent company, Textron, is reportedly bidding to purchase (at least) part of Columbia Aircraft. ANN broke the news several days ago on the sale of Columbia Aircraft actively being pursued... and that three parties were identified as having interest in taking over all or part of Columbia Aircraft. An acquisition of Columbia by Cessna would rock the GA piston world. The last time I checked, the one prerequisite for a Cessna piston aircraft was that it have high wings...and of course the Columbias have a sleek composite wing sprouting from the belly. So if some of the chatter across the web forums in the last two years is to believed, Cessna has always had plans to build some sort of low-wing "Cirrus killer", and buying Columbia would be a big, in-your-face way to make that happen. 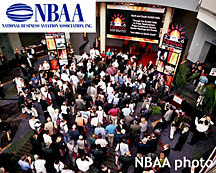 So as NBAA gets going, and AOPA Expo is just around the corner, as always things are abuzz big time. And over at the Cirrus tent in Atlanta, while people drool over the The-Jet, bet the farm that management will have their ears tuned to the grapevine for any official news that Textron has become a seriously competitive competitor.